Excessive CEO Pay and Job Losses: Are They Linked? Three weeks before Christmas in 2008, Philippe Dauman and Thomas E. Dooley, two top executives at Viacom Inc., wrote a “Dear Colleagues” letter to the employees of the media conglomerate informing them that the company was downsizing its workforce by 7 percent. That represented 850 jobs, 850 human beings, who would be looking for work in the midst of the worst job market in 25 years. The layoffs were not performance based. Indeed, the men who wrote that Dec. 4, 2008, memo -- “Phil” and “Tom” is how they signed their names -- insisted that the departing employees should be proud of their contributions to the company that no longer needed them. In an accompanying press release, Viacom also said that it hoped that the staff reductions, coupled with pay freezes for senior executives, would save some $200 million in 2009. It happened that way, too: That year’s financials showed the company’s revenues were nearly as high as in 2008, but with less overhead. 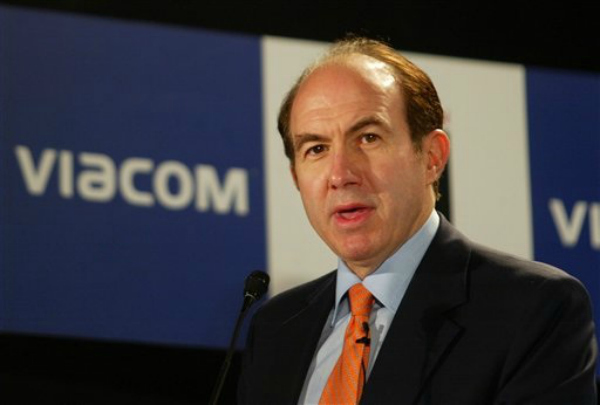 Apparently pleased with their own cost-cutting efforts, Dooley, Dauman (pictured), and Viacom Chairman Sumner Redstone paid themselves $165 million in salary, bonuses and stock options for the first nine months of the 2010 fiscal year. That figure is not a typo. Nor is it an isolated example. For the past generation, executive compensation has been rising at an astounding rate in the United States. In the early 1980s, the supposed “decade of greed,” the typical CEO made 42 times as much money per year as the average worker at his company. By the beginning of the Great Recession, this ratio had risen to approximately 500-1. Because so much of executive compensation is paid in stock options, that figure has since declined to around 350-1, but it’s still the highest in the world -- by far -- and it’s rising again. Since December 2007, American workers have been caught in a vice. Large corporations have been shedding jobs at a prodigious rate while small businesses struggle to survive -- and start-ups are lagging. The upshot is a persistent unemployment rate of 9 percent. That number represents 14 million Americans actively looking for work who can’t find it, 45 percent of whom have been unemployed for more than six months. A closer look at the numbers furnished by the Bureau of Labor Statistics shows the full extent of the problem is even bleaker. Another 2.5 million Americans want a job, but are so discouraged they have quit looking. And 9.3 million people are “under-employed” -- they are working part time but want to be working full time. The explanations being peddled to the American people for this crisis are many, and varied. The 2012 Republican presidential candidates have blamed government red tape and regulations -- and constant battles over the tax rates -- for a creating economic “uncertainty” that is causing employers to shy away from new investment and new hiring. “The future for taxes has been left up in the air,” says Mitt Romney. “And uncertainty is not a friend of investment, growth and job creation.” Another frequent target is the Patient Protection and Affordable Care Act signed into law by President Obama in 2009. “Obamacare is killing jobs,” Michele Bachmann says simply. She speaks for almost the entire Republican Party. A Chamber of Commerce-backed study seemed to back up this assertion: One-third of business owners surveyed cited concern about the health care mandate as either the primary or secondary reason they are not expanding their firms by hiring new employees.